Sometime last year (in this post), I went with a group of friends to Brickyard Gastropub in Hell’s Kitchen and wrote about the surprising number of vegetarian options there and how much I liked the food. I also promised to go back to Brickyard Gastropub to get pictures and to tell you more about the food there. 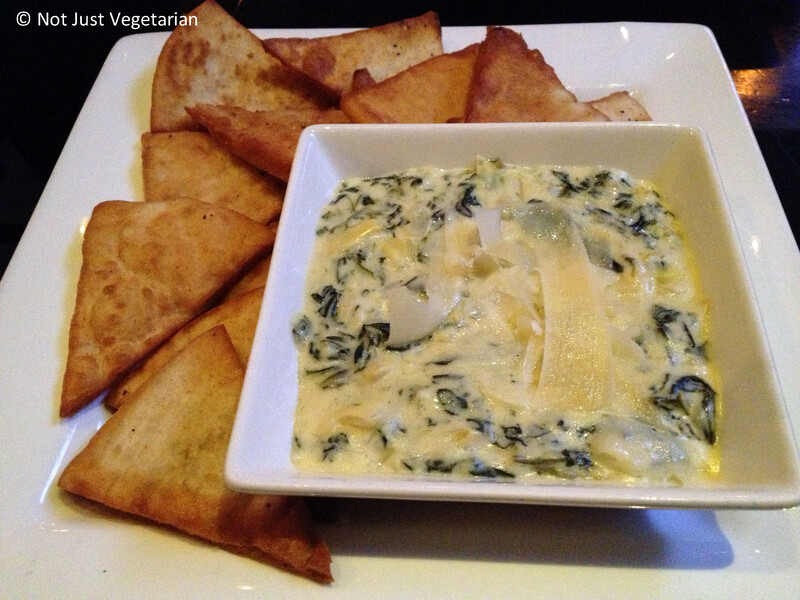 Spinach Artichoke chips with Pita chips: Loved the dip loaded with 3 cheeses (I love cheese, period). The pita chips were sooooo good – very crispy and flavorful (they were well-salted). 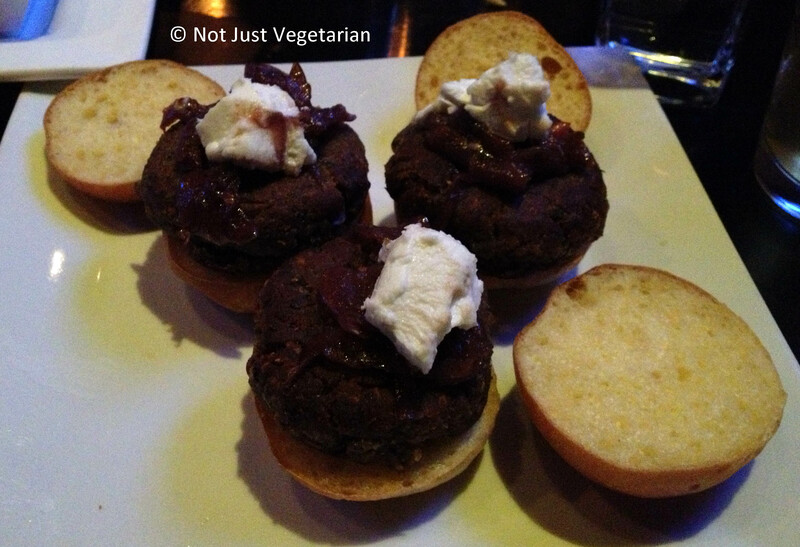 Veggie sliders: These were delicious on my previous visit. This time they were mushy and bland. I could barely taste the red onion marmalade. Consistency in preparing Veggie sliders does not seem to be the kitchen’s strength. 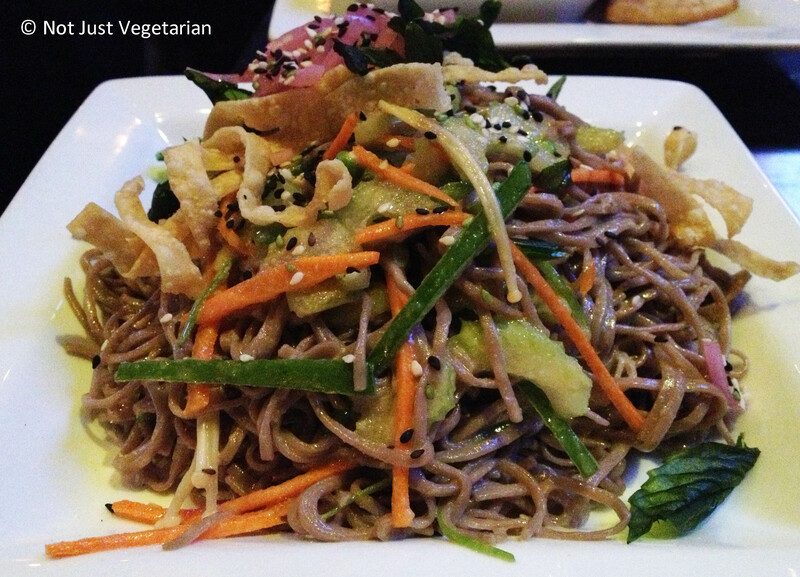 Buckwheat soba noodles: These noodles were delicious in the wasabi-soy vinaigrette which added a nice kick to the noodles, but did not make them too spicy to eat / enjoy. The wonton crisps and the crunchy carrots, celery, and other vegetables added great texture to the dish. This seems to be a vegan dish, although I did not check with the restaurant. If I were to go back to Brickyard Gastropub (and I want to), I would get the above dishes again and / or some of the other vegetarian and vegan options on the menu at Brickyard Gastropub. The Menu is not up on MenuPages yet, so try their website. Go to Brickyard Gastropub to try their vegetarian and vegan dishes, and enjoy locally sourced beer and food!! For more details on Brickyard Gastropub and for some trivia on gastropubs, see my earlier post titled “Gastropub Experience“. Beyond the noodles, are their veg options healthy ? Their House green salad, the spinach salad, and brickyard salad seem healthy to me. Also, they have a healthier version of fries – sweet potato fries. Try them if you go there and let me know if you like any of these. It’s always going to be tough finding healthy choices at a Pub, even if its a Gastropub. Having said that, I think their house green salad, spinach salad, and brickyard salad all seem healthy to me. They also have a healthier version of fries – sweet potato fries. If you do go to Brickyard Gastropub and have a chance to try these, let me know how they taste and if you like them.